To celebrate, comfort, console or cheer… J & J Florist has arrangements for every occasion! 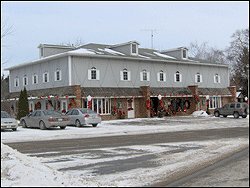 We’re a local Fonthill, Ontario flower shop serving the area since 1976 with a wonderful variety of fresh flowers, plants and unique gift ideas to suit any style or budget. Owner, Jack MacGregor is a prestigious member of American Institute of Floral Designers, Canadian Academy of Floral Artists, Member of Colour Council. He has also decorated the White House for Christmas, inaugurations and functions, and has taught in floral schools and given many seminars throughout Canada, USA, Puerto Rico, China, Hong Kong, Korea, Italy and Israel. We hope you enjoy your online shopping experience with secure 24-hour ordering right at your fingertips. If preferred, you may call us to place orders direct at (905) 892-2770. It is our pleasure to assist you with any local, as well as worldwide deliveries and remember that corporate accounts are always welcome. We offer Peninsula daily floral delivery and also to local funeral homes and hospitals, for your convenience. Funeral & Sympathy Floral Tributes ~ Ask our staff about custom-designing a sympathy arrangement after the passing of a friend or loved one. You can depend on us to help you choose beautiful funeral flowers that express your heartfelt condolences. Wedding & Special Event Flowers ~ Let us create gorgeous bouquets, flower arrangements and on-site décor for your dream wedding, corporate functions, parties or other special events - large and small. We also have rentals available and money boxes. Call (905)892-2770 to schedule a consultation with our wedding coordinator. Gift Ideas for Any Occasion ~ Browse our variety of Dish Gardens, Tropicals and Green & Blooming Plants for gifts that bring life to any room or office. We create Gift Baskets, Fruit & Candy Baskets and Candy Trees, as well as offering a nice selection of Baby Gifts, Candy & Chocolates, Scented Candles, Silk Flowers, Stuffed Animals, Balloons and more. Thank you for visiting our website for flowers delivered fresh from a local Fonthill, ON florist and convenient online ordering available 24 hours a day! !